People’s Light and Theatre Company presents The Emperor’s New Clothes, through July 11, 2010. A world premiere production, with a script by Richard Hellesen, it is based on the children’s classic tale by Hans Christian Andersen. People’s Light & Theatre Company presents The Emperor’s New Clothes, from June 16 – July 11, 2010, on the Main Stage. A world premiere production, with a script by Richard Hellesen, it is based on the children’s classic tale by Hans Christian Andersen. Abigail Adams directs. The Emperor’s New Clothes is a slapstick, mad cap, puppet-romp version of the classic tale of an Emperor with a passion for fashion. In the Empire of Abalonia, the bratty new Royal demands a trendy new wardrobe. Enter two scamming rogues who are only too happy to help while trying to loot the royal treasury. People’s Light Mary Elizabeth Scallen plays the Policeman in the play and is a puppeteer. “This production is pulling from a lot of classic comedy traditions from the past and, combined with the puppets, it really offers a unique spin on a classic fairytale. 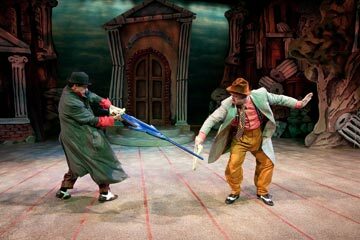 Because it’s a slapstick comedy, the play is very fun and surprising. The characters in the play create a lot of mayhem-sort of like rambunctious kids getting in a lot of trouble so the kids will really love it. And the parents will appreciate the quirky tone of the Marx Brothers. The only person in the town who ‘sees the truth’ in the end is the youngest person in the play and there is a neat message in that,” explained Scallen. The Emperor’s New Clothes, part of the TARGET Family Discovery Series, features Resident Company Members Kevin Bergen, Alda Cortese, Marcia Saunders, Mary Elizabeth Scallen and Tom Teti, who join guest artists Pete Pryor, Andrew Kane and Claire Inie-Richards, in addition to over 50 handmade puppets by Martina Plag. Before each show, children are invited to D.Y.O.B. (Decorate Your Own Boxers) for free. The crafts will begin one hour before each performance in the upstairs lobby. Go to www.peopleslight.org for details. The play opened on Friday, June 18th at 7pm and runs through July 11th. Audiences are encouraged to join the artists after each performance to discuss the production. People’s Light & Theatre Company is located at 39 Conestoga Road, Malvern. For tickets call 610.644.3500 or visit PeoplesLight.org. This project is supported in part by TARGET. Single tickets start at $20 for youth and $29 for adults, with special discounts available for students and groups of 10 or more. 10am student group performances, discount meal packages, and talk-backs with the artists are also available. For more information or to purchase group tickets, call 610.647.1900, ext. 134 or email group@peopleslight.org. Actors, prices, performances dates and times are subject to change. Additional service charges may apply. People’s Light, a professional theatre founded in 1974 in Chester County, Pennsylvania, makes plays drawn from many sources to entertain, inspire, and engage our community. We extend our mission of making and experiencing theatre through arts education programs that excite curiosity about, and deepen understanding of, the world around us. These plays and programs bring people together and provide opportunities for reflection, discovery, and celebration.